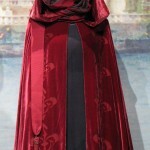 Handmaidens were personal aides to royal personalities of the galaxy. Perhaps the most notable of handmaidens were the handmaidens of the Monarch of Naboo. An unidentified Queen, who reigned long before the Invasion of Naboo, began the custom for Naboo monarchs to have an entourage of handmaidens to ensure their safety.During the reign of Queen Amidala, the handmaidens bore a striking resemblance to their mistress. They were highly trained in order to act as bodyguards, decoys and confidantes to the Queen,roles devised by Captain Panaka. Queens Jamillia and Kylantha were also known to employ handmaidens.